Yes, the blogging daily thing has worked out brilliantly I can see. Never mind. For instead of typing nonsense on the Internet I was away in Glasgow, land of rain – cold unpleasant endless rain – visiting my lovely sister. 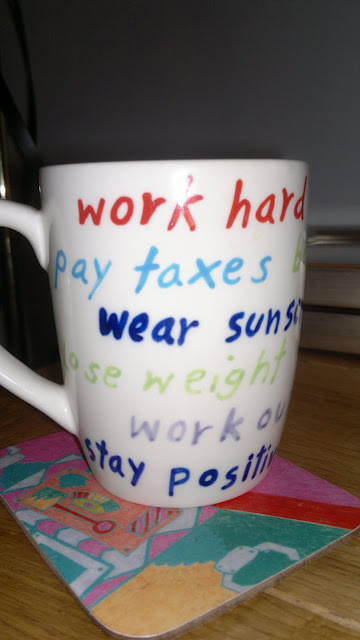 Now I rolled my eyes a bit at the tea mug’s dubious advice, but thought little of it. There was some good tea in that mug after all. Quality tea that I was enjoying very much. 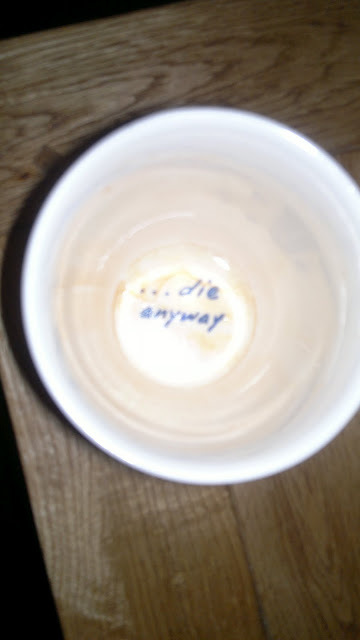 Yes, reader, at the bottom of my tea mug I found a DELIGHTFUL reminder of DEATH. (Incase you can’t read it, it says “die anyway”.) Now, it’s one thing when tea leaves arrange themselves badly and you happen to be with someone who’s into reading tea leaves, but it’s quite another to have someone SCRAWL DEATH IN THE PORCELIN (or whatever they make mugs out of) as part of the OH SO INSPIRED DESIGN and have every hapless tea drinker end their perfectly nice cup of tea with a memento mori.